O&P Glass began as an informal partnership between Alan Oakes and Richard Parkhurst on June 9, 1979. In 1978 Alan Oakes purchased a home with a large commercial lot at 3 Cushman Road in Winslow, Maine . During the spring of 1979 Alan Oakes built a 24' X 36' shop which became Oakes & Parkhurst first location. In 1981 real growth began with the development of the OPE208 Air Control Panel and the introduction of auto sunroofs to Central Maine. In the fall of 1981, the partnership incorporated. The physical size of the Winslow complex was doubled. In October of 1982, Alan Oakes sold his share of the ownership to the corporation, thus making Richard and Janet Parkhurst the only remaining stockholders. In April of 1983, the corporation opened a branch in Belfast, Maine. In the fall of 1982, O&P Glass became the second combination window and door manufacturer in the State of Maine. Also in 1983, stained glass products and instruction were added. In December 1983, the Parkhurst s purchased the property at 3 Cushman Road from Alan Oakes and leased it to the corporation. On September 9, 1984, O&P Glass acquired Skowhegan Glass at 257 Madison Avenue, Skowhegan, Maine. This was a five-year old company with a strong auto glass market. During May of 1986 O & P introduced sunspaces with the installation of a full-sixed model at the Winslow Location. In the fall of 1986, Janet and Richard Parkhurst traveled to Germany to research replacement windows and insulated glass equipment. From this trip emerged the beginning of insulated glass manufacturing in the Winslow shop and the selling of high-quality vinyl replacement windows. In June of 1987, Janet and Richard purchased a building at 65 High Street in Belfast. They leased this building to the corporation to house the Belfast shop. The building was renovated to include the addition of a three-story sunspace. 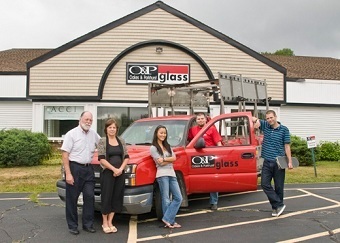 In September of 1987, O&P Glass leased a building at 99 North Main Street in Farmington, Maine. The branch opened October 1, 1987. In April 1988, Richard and Janet bought and renovated buildings at 10 Railroad Square, Waterville, Maine to accommodate the expanding stained-glass market. Stained Glass Express was open for business in July of 1988 utilizing 3,200 square feet of the property. In January 1991, Glass Express entered into the stained-glass mail-order business with the publication and distribution of a 100-page catalog. In December of 1991, Glass Express installed its first commissioned stained glass window at St. Bridget's in Vassalboro. In the summer of 1992, O&P instituted a new sales approach by putting a full-time salesperson on the road. During August of 1992, the company made its first bookkeeping transfer via modem from branch computers to the corporate computer in the Winslow office. By October 1992, all shops were computerized with centralized bookkeeping in Winslow. In 1993, O&P Glass expanded into vinyl siding and the garage door market. Richard developed a bullet-resistant lexan/glass unit for primary use in steel doors manufactured in Canada. In 1993, reorganization put in place a CEO to separate store management from large contract management. At this time O&P acquired its first bond with a bonding capacity up to $75,000. In 1995 Janet and Richard purchased a building in Farmington on Route 2 & 4 and moved the Farmington Branch to this building. In 1995, O&P performed its first Electronic Data Interchange (EDI) with Concord Group Insurance Company. In 1995, after two years of research and development with Bullet-resistant glass/lexan units O&P Glass was awarded a contract with External Affairs of the Canadian Government through Apex Industries. Apex is a manufacturer of steel products and O&P became their distributor of steel doors in the Northeast. The contract with External Affairs was to provide bullet-resistant units to Apex for them to put in their steel doors. O&P units have gone into Canadian Embassies in: Los Angeles, USA; New York City, USA; Santiago, Chile; Port of Spain, Trinidad; Kingston, Jamaica; Port-au-Prince, Haiti; Bangkok, Thailand; London, England; Zaire, Africa; Santo Domingo, Dominican Republic; Bogota, Columbia; Libreville, Gabon: Lebanon, Beirut; Cairo, Egypt; Bern, Switzerland; Antwerp, Belgium; Shanghai, China; Abu Dhabi, Oman; Abuja, Nigeria; Kigali, Rwanda. In 1996, O&P completed a 22'x66' barrel vault (our first) and a 4'x200' slope reglazing at Bangor International Airport on time within budget. In February of 1997 O&P launched its first web page with Maine Online. It featured the Glass Express store. In 1998, Janet and Richard purchased a 27,000 square foot building complex on the Pond Road in Manchester, Maine to house corporate offices, a sixth branch, and rental space. With this expansion, O & P added another outside salesperson, a project manager/estimator and several more hourly employees. The Manchester location placed O & P in closer proximity to the larger commercial markets in southern Maine. In 1999 O&P added garage doors and operators to their product line. On April 2, 1999 Janet and Richard purchased Bangor Glass in Glenburn, Maine, making the total number of branches, seven. Shifting markets and the expanding capabilities at O & P lead to the development of a revised growth plan. As a result of Strategic Planning sessions during 2002 and 2003 Richard and Janet decided to focus on the development of their Contract Glazing Division and relax efforts on the residential side of the glass business. The evolved plan included eliminating branches and developing commercial efforts out of the Manchester, Maine location. In June of 2004 the Glenburn location was closed the buildings sold. The purchasers put other businesses in the building. In June of 2004 the Skowhegan location was closed and all employees were transferred to Manchester. In June of 2005 the Winslow location was sold to Bob Jacobs. It now operates as Windows Plus. In July of 2006 the Belfast location was sold to PR Construction. They operated for a time as PR Glass in Belfast, moved the business to Fairfield where they eventually closed. In November 2008 Janet and Richard's son Tobias joined the company as an estimator in the Contract Glazing Division. In September 2010 the Farmington location was closed and the building was sold. The owners put other businesses in the building. In 2011 O & P added an additional Estimator/Project Manager. In January of 2012 Tobias became the COO of Oakes & parkhurst Glass and became a part Owner through stock purchase. In October 2012 Stained Glass Express formed its own corporation and separated from Oakes & Parkhurst Glass in preparation for the sale of O & P to Tobias Parkhurst. In April 2013 ownership of O & P to Tobias Parkhurst and Soo Parkhurst.